"Ground Water is among the Nation's most precious resources. Measurements of water levels in wells provide the most fundamental indicator of the status of this resource and are critical to meaningful evaluations of the quantity and quality of ground water and its interaction with surface water. Water-level measurements are made by many Federal, State, and local agencies. It is the intent of this report to high-light the importance of measurements of ground-water levels and to foster a more comprehensive and systematic approach to the long-term collection of these essential data. Through such mutual efforts, the Nation will be better positioned in coming decades to make wise use of its extensive ground-water resources." The paragraph you just read was written by Robert Hirsh as the forward to the United States Geological Survey's Circular 1217 entitled "Ground-Water-Level Monitoring and the Importance of Long-TermWater-Level Data". This new page will explain the benefits of groundwater monitoring and use examples to show how this management tool can help you manage your groundwater resources. Water system managers make critical decisions every day. As you face increasing demand, you find yourself in need of a new well. Is your only option a program that involves test bores, test wells and new land purchases? Maybe not if you know the health of your source aquifer. By starting a groundwater level monitoring program at your system today, your option may include only aquifer testing to establish well spacing. Implementing a groundwater level monitoring program now can provide you with the information needed to further develop the aquifer you are currently using. No more test wells because you already know the water quality and the production potential of the aquifer. No more searching for an acceptable wellsite as you have one present are ready to go. Below are four case studies on groundwater level monitoring at public supply wells. For some additional information of Dan's hobby of groundwater level monitoring, click GCGWRI. For example, consider System X. 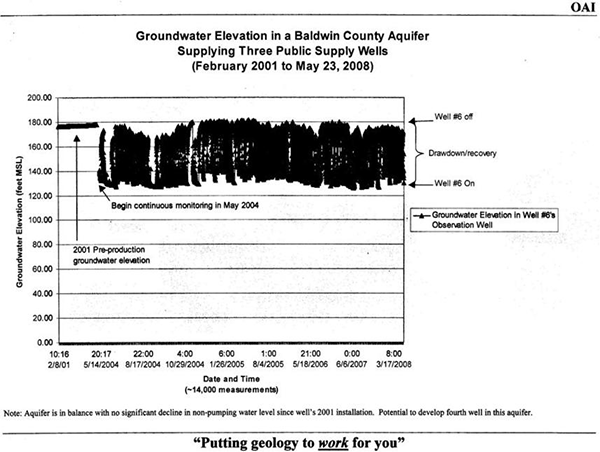 They installed Well #6 in 2001 and began a pro-active groundwater level monitoring program in 2004, see chart below. In 2008 another well is needed to meet demand. The data from their ongoing groundwater level monitoring program shows that the aquifer supplying Well #6 is not being over produced and that it could support another well. Information on the target aquifer's water quality and production rate is known from Well #6 so a test well is not required. All that was needed for the development of their next well was aquifer testing to determine the appropriate well spacing for the new well and, if necessary, minimal land purchase costs adjacent to their existing wellsite. The cost of the monitoring program pales in comparrison to the cost of a single dry hole, not to mention compared to the cost of a test well required to find out water quality and production potential of a new aquifer. Call OAI to discuss setting up a groundwater monitoring for your production wells. The program will more than pay for itself. 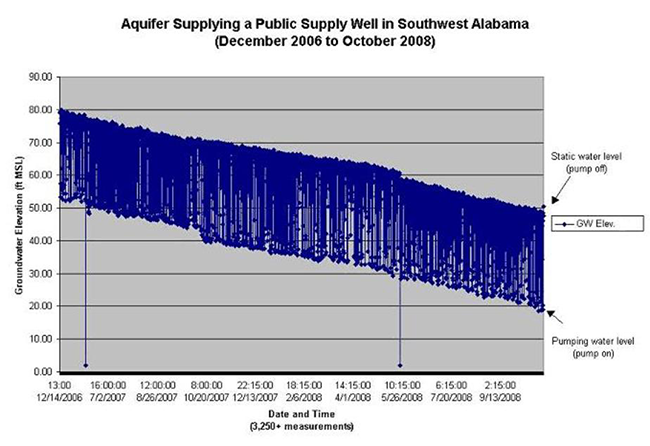 This fictitious southwest Alabama public supply system installed their first well in early December 2006 opting not to institute a groundwater level monitoring program. That's too bad for them and the public they serve, here's why. The well's pump is set at the top of the well's screen at an elevation of 10 feet with respect to mean sea level (MSL). At completion, the static groundwater elevation elevation measured 80 feet MSL (70 feet over the pump) and the initial pumping groundwater elevation was 52 feet MSL (42 feet over the pump). Comfortable with things the way they were, the system neglected managing their groundwater resource and did not implement a groundwater level monitoring program. 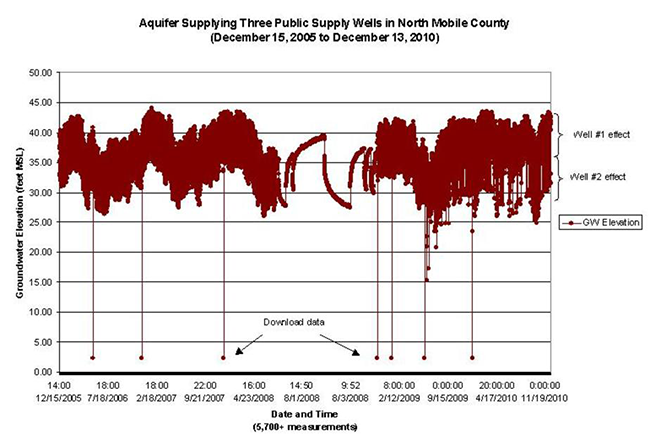 Had a groundwater level monitoring program been implemented when the well was completed, the system would have the data shown in the graph above. The graph indicates that the static and pumping water levels fell about 28 feet during the two years following the well's completion. By the end of the second year, December 2008, the pumping water level was only 10 feet over the pump. With a 14 foot rate of decline per year, the pump will begin breaking suction sometime during August or September. Unable to lower the pump into the well's screen, the system will be forced to drastically cut back on the well's operation reducing production and potentially requiring stringent water rationing measures. Without the benefit of a monitoring program, the system's Board of Directors had no fore knowledge of an impending problem and was caught flat footed when the well began breaking suction in the fall of 2009. If they had an ongoing groundwater monitoring program, they would have the data show in the graph above and they could have begun developing a plan for an additional source of supply up to 1.5 years before their supply situation hit critical mass. If you are a Board member and your system is not actively monitoring your groundwater resource, it is not too late to start. Contact OAI today and begin a cost effective, pro-active aquifer management program for your system's source of supply. The headache you save may be your own. The principal aquifer in southwest Sumter County is the Nanafalia Aquifer. The Nanafalia Aquifer crops out from northwest to southeast across the southern third of Sumter County and is the primary target for public supply wells south of York. The aquifer is currently being monitored by OAI for a Sumter County public water system. Over 9,850 water level measurements have been recorded and converted to groundwater elevations dating back to 2001, see below. 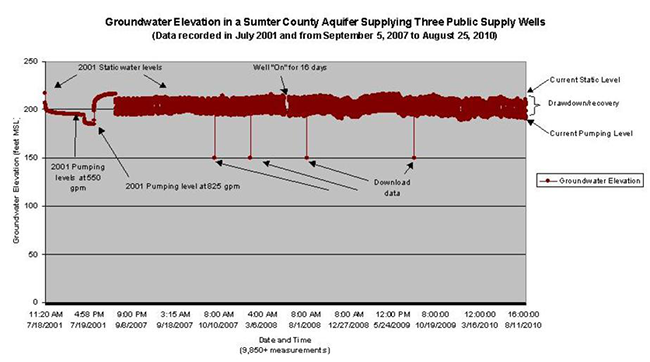 In September 2007, a continuos recording logger was installed with a gradual rise in groundwater elevation recorded from then until the Summer of 2009 where it was approaching the 2001 elevations indicating the aquifer was not being overproduced. Beginning in the Summer of 2009, the non-pumping groundwater elevation has dropped about nine feet. A prolific Miocene sand aquifer in north Mobile County supplies water to several public supply wells. A groundwater monitoring program was initiated at the site of one such public supply well in December 2005. Water level data from the logger was converted to groundwater elevation and tracked over time. A cyclic pattern of rising and falling groundwater elevation occurred with the higher elevations recorded in the cooler months and the lower elevations recorded in the warmer months but the overall groundwater elevation pattern was stable with the aquifer not being over produced. Armed with this data, extensive aquifer testing was completed at the site with the data from both efforts supportive of the completion of a second well in the aquifer at the site. The new well boosted site production by 500 gpm with little additional piping, no "dry holes" and minimal land purchase. The two wells are 91 feet apart and the aquifer continues to support water production from both wells with no indication is it being overproduced. MW-2 is a 13-foot deep well located in mid-town Mobile. The water level in the aquifer responds to precipitation events of 0.75 inches or more with a rise in the aquifer's potentiometric surface. Associated with this rise is a sharp change in direction of groundwater flow. Depending on when a groundwater level survey is conducted, the flow direction can be off as much as 180 degrees. On groundwater contamination projects that depend on knowing the direction of flow, not being aware of these changes can ultimately lead to failed remediation efforts and wasteful spending on monitoring wells improperly placed.